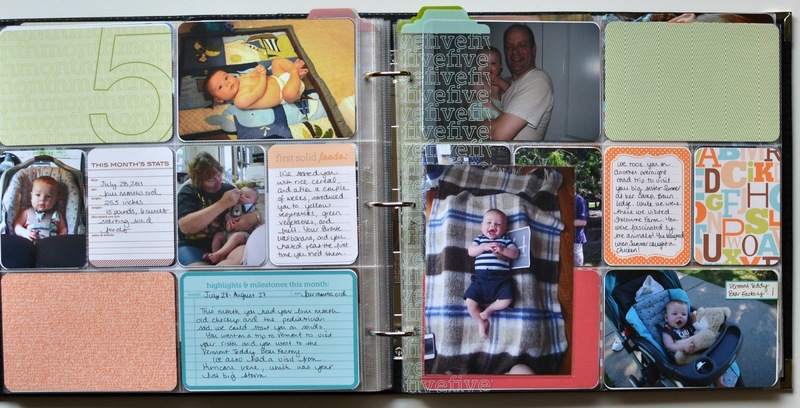 A Vegas Girl at Heart: Austin's Baby Album (Part 2 of 3) - Photo Heavy! 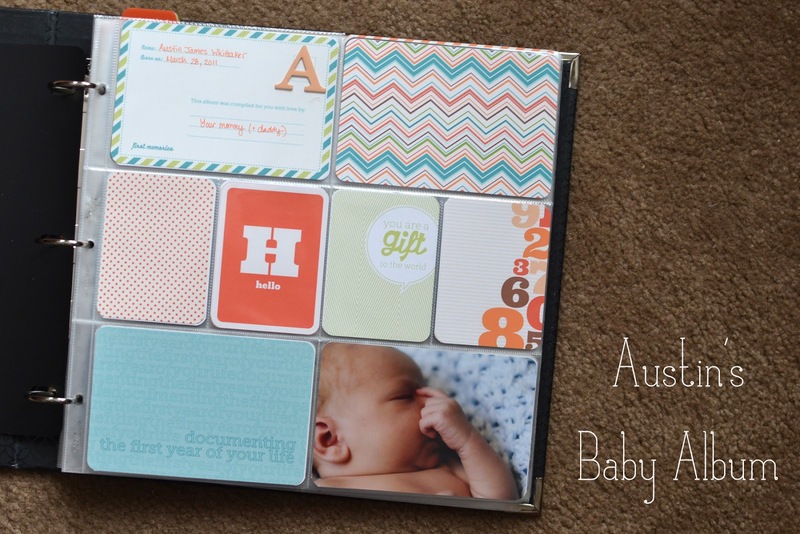 Austin's Baby Album (Part 2 of 3) - Photo Heavy! I'm almost done with Austin's baby album. Sharing months 2 through 6 with you today. If you missed part 1, check it out here. I am using the digital version of the Project Life Baby Edition for Him through AC Digitals. Here's month 2. On each month I did an insert with Austin's monthly photo. 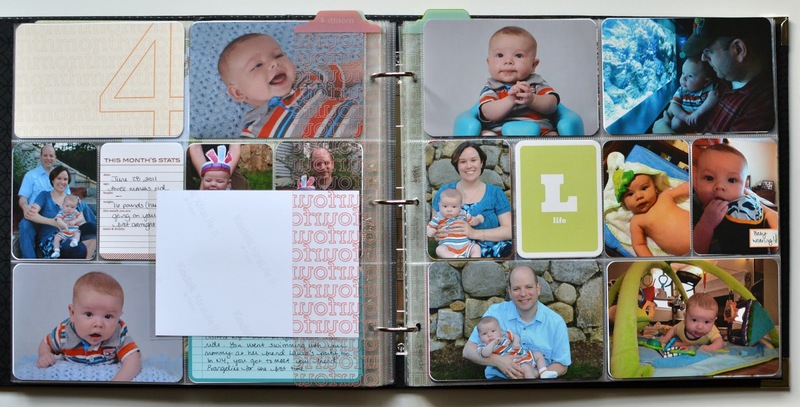 I used the 5x7 page protectors in either horizontal or vertical. Oh and I use the Baby Edition for Him dividers too. (If you didn't know this already, they come with a sheet of plastic over them - peel it off, the dividers look amazing underneath that plastic protector layer). I stuck in my Mother's Day card behind the photo. I'm using two spreads for each month. Sometimes I didn't have a photo for a particular 4x6 slot so I printed some of the Baby Edition for Him digital paper and cut that up to size. I just want to get this album done, so I'm not fussing with trying to find something overly creative to fill those slots. The paper is pretty and works just fine. On one card on the right side above I wrote down Austin's typical daily routine at this age. I pulled that info from a blog post. 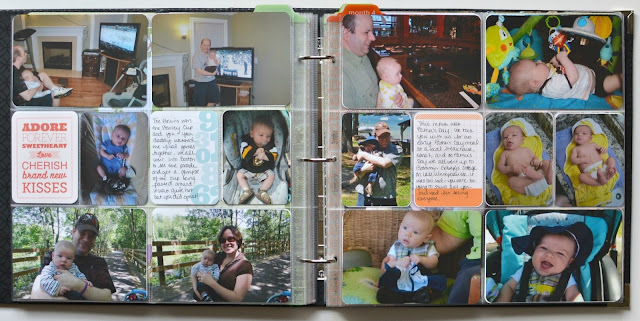 This month I added in some papers from his first day of daycare into an 8.5x11 page protector. The little labels you see on some of the photos are my freebie ones that match the Baby Edition for Him, if you haven't seen them before. The wood "Good Morning" embellishment is from Recollections. You'll notice I had a lot of empty spaces this month. Filled them with the Baby papers along with some filler cards from various stacks found at Michaels and Hobby Lobby. More fillers used on this month. I really did add in all the photos I wanted to for these months. As I did do Project Life after he was a couple of months old, many photos are included in that album, so there isn't a major need to print absolutely every photo of him I took. I printed my favorites, added in filler cards, and these months are done. Simple, but they look great. It's an album I'm proud of. Part 3 should be coming within a few weeks - the photos are in but I have a few slots to fill and some journaling to do. This is so cute, so sweet, and so pretty! And omg, how did he grow up so fast?! I can't take it! Love it so much! Can I ask where you get the different size page protectors? I usually buy mine from Amazon and probably will still do this even once they come available in stores. I also mix it up on occasion with some Snap protectors or some from Michaels that have different layouts. It goes by SO fast. I have no idea where the time went, and I've been with him every day. It's like he went from a baby to a little boy overnight sometimes. The pages look awesome Melissa for getting it done and looking fabulous ! Hi! I found your pictures on pinterest and I love your layouts! I just had my baby boy and am working on his album! So, this might be a stupid question and I am reading WAY into it... but how did you detail "1 Month" old? Did you right stuff down that happened before they turned 1 month or did you write down things that baby did after they turned one month old? I would love to hear how you chose to do it! 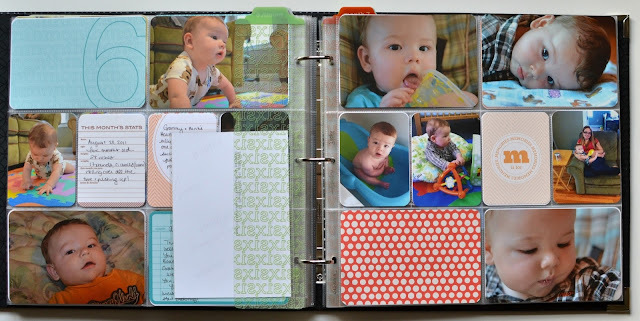 If you check out this post (the first part of the album), I use the cards as 1 (first month, birth to 1 month old), 2 (second month, one month to 2 months old), so 2 is for "one month old," so everything that occurred between 4 weeks and 8 weeks. Does that make sense? So the 12 is for the 12th month, and then there'll be a section for him being 1 year old/birthday party, etc.